Old MacDonald had a Farm by Wendy Straw – We read “Old MacDonald” and sang together many times. R carefully listened and watched as I pointed to and named animals on the different pages and especially loved it when I made the different animal sounds. 1. Backside Animal Match – I introduced R to a new puzzle I had made. I put clipart photos of animals onto different coloured foam pieces. I then cut them in half to make puzzle pieces. The activity was more focused on demonstrating how to do the puzzles. I would put the front piece of the puzzle down in front of her and then hand her the second piece. I would then guide her to place it in the appropriate spot next to the front piece. After trying this activity again two more times over two days, R was able to do it with minimal support from me. I like to introduce new activities using the “I do, we do, you do” method in which I first demonstrate the activity, I then guide R to do the activity with me and then, finally, I have R practice the activity on her own. a. To make this activity more difficult, glue the animals onto the same coloured foam so that the child cannot use the colour to match the different animals. 2. Felted Cow – I also made another kind of puzzle for her to help further focus on cognitive development skills. I drew an outline of a cow (from a pic online) on a white piece of felt. I made cut-outs with coloured felt of all the cow parts (hands, feet, tummy, nose, eyes, mouth and ears). I would ask R to point to her own body part and then point to the same cow part on the felt template. I would then get her to place the loose parts on the cow after guiding her to the correct location. R loved this activity and especially loved pulling the pieces off. a. Make multiple felt animal puzzles and have all the loose parts together. Have the child match the correct parts to the correct animal. b. Ask older children to label all the parts on the white felt background. 3. 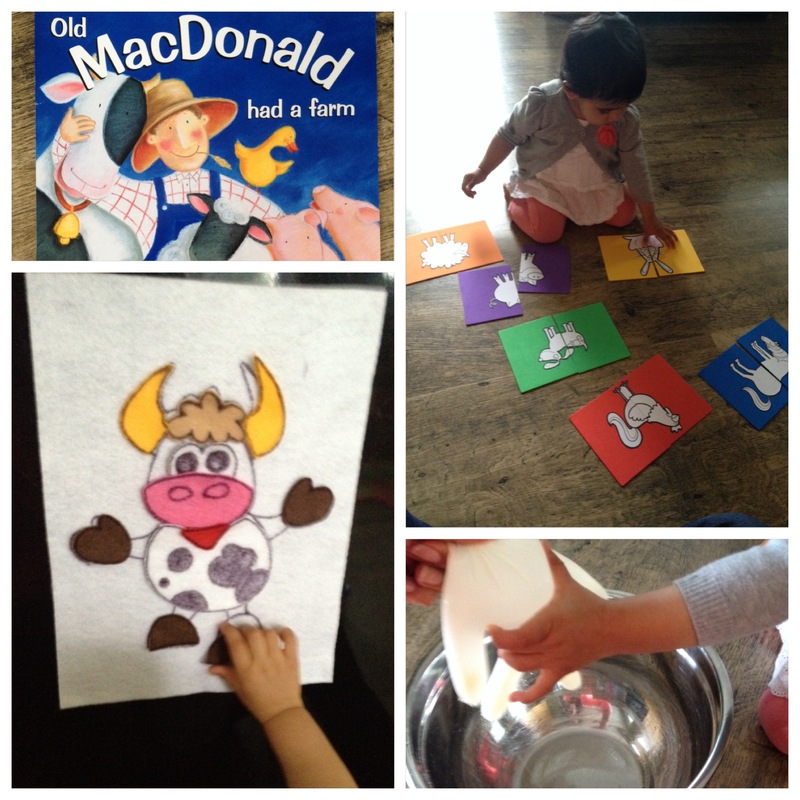 Milking Cows – R got some fine motor skills development in as she practiced “milking” a cow. I pierced multiple small holes in the finger tips of all of the fingers on a rubber glove using a needle. I then filled the glove with water and held it over a bowl. R squeezed the water out! She enjoyed this activity so much that I had to refill the glove multiple times.